Deep Purple • Orpheum Theater, Minneapolis, USA. 19th June 2011. Two very contrasting reviews from a show on the US orchestral tour, it seems the sound guys haven’t got it right for everyone! The photo is actually from Brazil in 2009, courtesy Alexandre Cardoso. More reviews from the tour at deep-purple.net. I’ve been a huge Purple fan since 1977, but for one reason reason or another I’d never seen a live show until, finally, last night. My son and I (it was Father’s Day) were in the 3rd row of the balcony toward the left (Roger’s side of the stage). Seemed like a great spot to observe the spectacle. I knew that realistically it would probably just be an average performance, but that would still have been a great night. Unfortunately, I can’t say whether the performance was good, bad, or middling, because the sound (where we were) was just dire. Gillan was barely audible for the first few songs. Hearing Hard Lovin’ Man was bizarre. I knew the set-list, so I knew what song it was meant to be, and of course I could see the guys playing. But it was very hard to interpret what I was actually hearing as what I knew I should be hearing. In fact, for the first twenty seconds or so I wondered whether it was a new song! Other songs were recognizable, but that’s about all. It could’ve been anybody playing them. Every lick in the whole show, whether from Steve or Don, was either inaudible or just sounded like generic guitar or organ sound. The only mid-song guitar solo whose individual notes I could make out was the one in Highway Star, and I knew in advance what Steve was going to play. Don’s playing was only clear when he was literally playing alone. For someone like me, who loves Purple mostly for its instrumental and vocal virtuosity, this completely ruined the show. Only Paice’s drumming came over loud and clear, but of course I was getting some of that acoustically. I fear the orchestra made matters worse, since part of the sonic mush may have been the amplified orchestra. The sound may well have been terrific down in the stalls, but if the band is wondering why audiences aren’t very responsive, then one of them needs to get up in the balcony and take a listen while the others are playing. Ian and Roger did a combined drum and bass solo in the encore, and it really worked. Otherwise, very disappointing. This was Deep Purple’s first performance in the Minneapolis area since 2005 when the band played a free concert in front of 30,000 people at the Taste of Minnesota in St. Paul. Today’s show took place at the Orpheum, a theater once owned and renovated by Bob Dylan. The venue was a perfect fit for a symphony backed Purple. I was in the third row, the sound was incredible – and loud. Gillan was wearing white sneakers, unlike the barefooted screamer the U.S. saw the last time Purple was in the States. Several members of the orchestra were handing out ear plugs in the middle of the performance. The backing violinists were laughing and singing along with several songs. Highway Star first, followed by a miniature gong wielding Gillan, tapping – or should I say gonging – the instrument in the middle of Hard Loving Man. The orchestra really complimented Rapture Of The Deep, Knocking on Your Back Door and Perfect Strangers. I can’t imagine these songs without the orchestra. The conductor’s violin solo during Lazy stole the show. 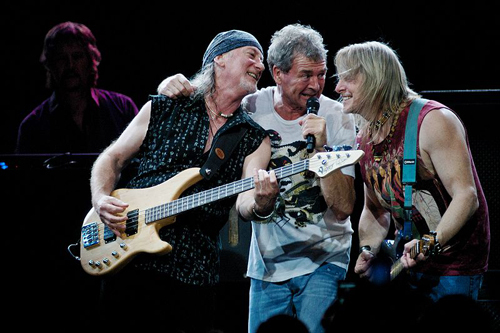 Gillan and Morse rocked back and forth together laughing during the Woman From Tokyo bridge; Gillan winking as the symphony added extra power to an already rockin’ tune. Gillan at times appeared to be whispering his yells. He held the microphone further from his mouth during the screams. Gillan’s voice was strong, not damaged, but he was holding back, perhaps because it was the third show in three nights and he needs to save his voice for the rest of the tour. Space Truckin and Smoke On The Water saw the crowd, who were on their feet throughout the entire show, really go crazy with fists pumping in the air and several people rushing the stage, forcing the laid back security to politely ask them to clear the aisles. On top of all of this was an amazing light show. Although there were some empty seats, the show was well attended – a ton of tour shirts were bought and worn. There definitely were several teenagers accompanying their dads to this Father’s day show. These theaters are perfect for Deep Purple. Let’s hope they return soon.